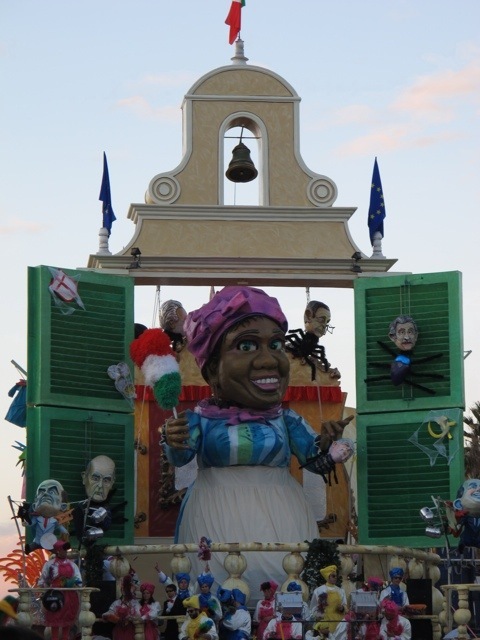 We arrived in Viareggio hours before the parade began, which gave us plenty of time to have a good look at the floats before they started moving around town. Once the parade begins there are thousands of people crowding the streets. 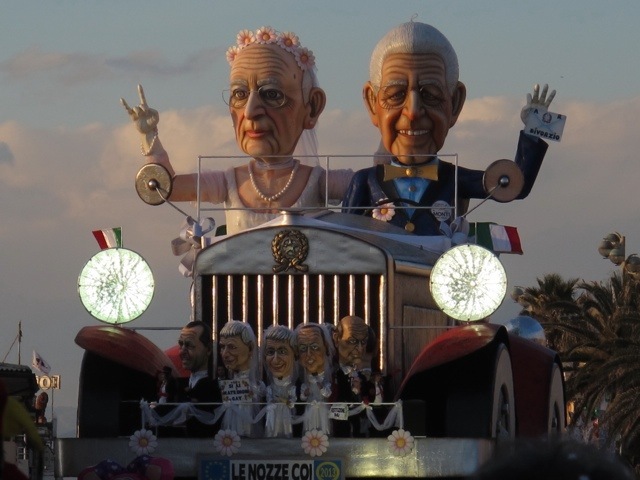 If this event happened in Australia the floats would be carefully separated from the audience by ropes and guards to keep people at a safe distance….not in Viareggio….people walk in front of, under and around the floats while they are moving. Keep in mind that these things are huge, some the size of a 3 story building, with lots of moving parts. Nobody seems to get hurt and everyone has a great time, without any evidence of alcohol. It is all very good natured and other countries could learn a lot here. One of the first floats we saw was this amazing jazz band, whose name suggests they are a bit tired of austerity. I was most impressed with the horn player’s eyelashes. 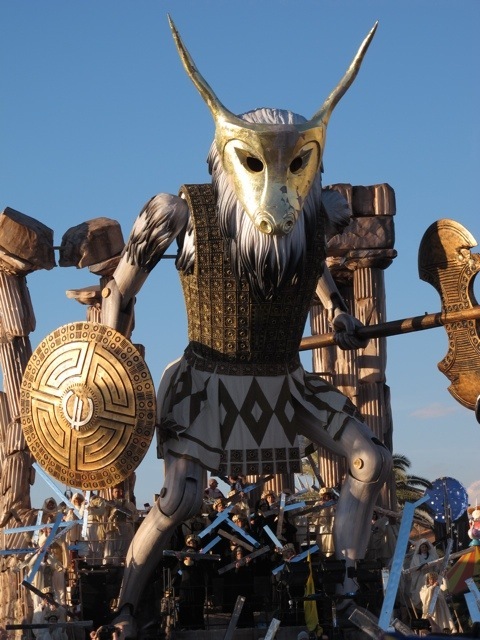 The next enormous float was a horned and bearded warrior with a crumbling building behind him, accompanied by a choir. The 3 monkeys… speak no evil, hear no evil, see no evil. Politicians getting their snouts in the trough…in the form of a table in the shape of Italy. A rather menacing clown…the characters in front of the clown were swaying on very long poles. The lovely lady below is cleaning out the cobwebs. Here are a few random floats that went past me in a blur. 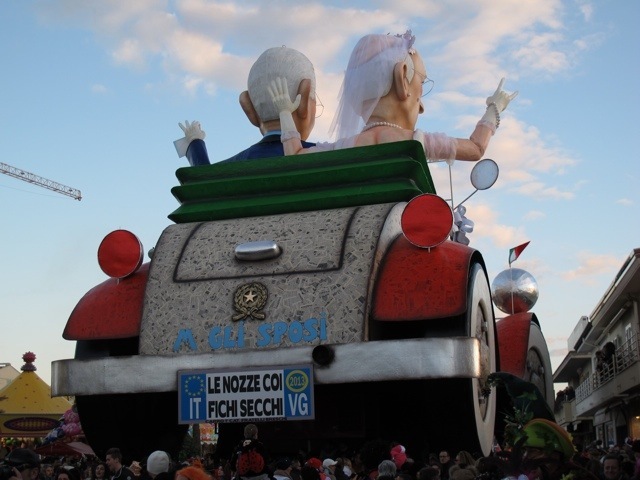 The next float was my favourite…the marriage of 2 dried figs. Now for the people I managed to get to stand still long enough to capture them on film. I wish that I could convey the madness that is Carnevale. I have been covered in foam and confetti and jostled by a very friendly crowd…I’ll be back next year for more. For some faces from Carnevale last year click here. Very nice Deb, keep up the fantastic work. Thank you, it was a fun day. Great photos, Debra. Thank you for working so hard to keep us beautifully informed. I always need to lie down in a quiet room for a while after Carnevale. 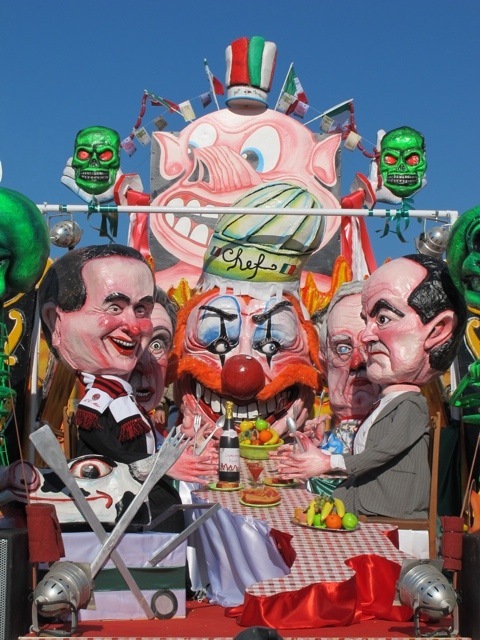 The Italians are masters of Carnevales – such flamboyant displays with subversive themes! 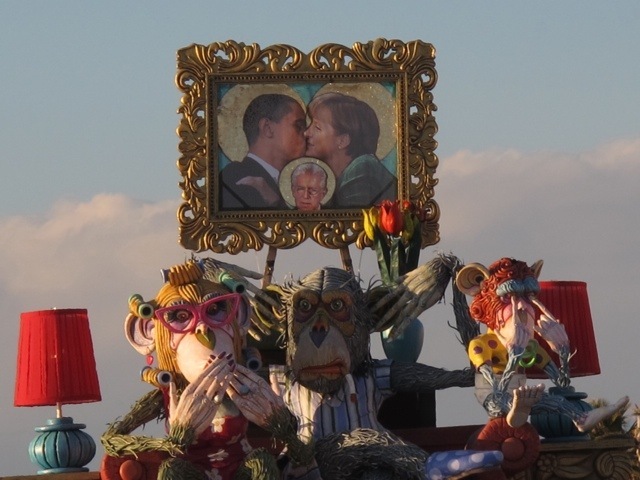 These artists designing the giant puppets have a field day expressing their political views in public as their ‘voice’. Also fun to watch, too! My husband and I visited the puppet workshops in Viagreggio, and were awed by the dimensions of their handiworks. People in the workshops were obliging and friendly, and we took some marvellous shots of them at work. Love your patchwork of Carnevale participants! I will go to the workshop one day soon. I am keen to know more about the float makers. 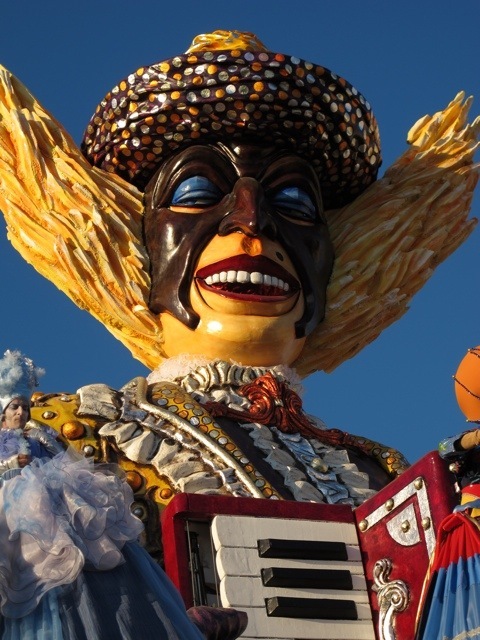 The Viareggio carnevale is fantastic and, as you say, can teach a lot to other countries about how to have a good time without any trouble and with minimum police presence. Compare, for example, the shootings and alcohol and drug abuse at London’s Notting Hill carnival (which, strictly speaking, isn’t a carnival at all since carnival means “carne” (meat) “vale” (farewell to) and, therefore, relates to the last rich meal (mardi gras) traditionally eaten before the period of Lent fasting in the church calendar) with the fun atmosphere and happy family groups to be seen at Viareggio. I also love the political irreverence of the majority of the floats. 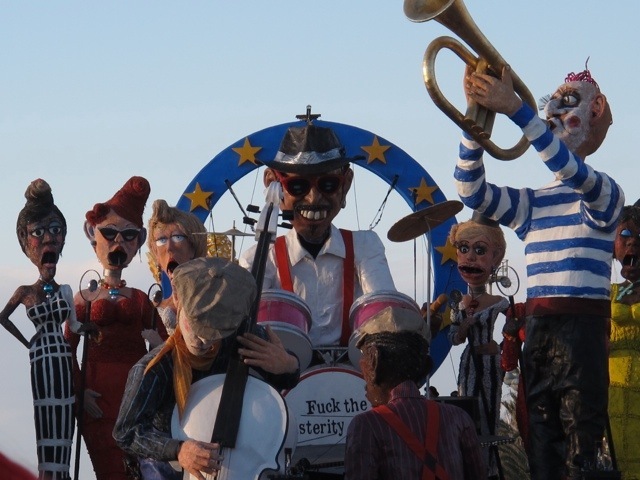 True, there is ample scope for them in crisis and corruption-torn Italy but, at least, there is a safety valve in the ridicule and satire of the “big” political figures shown in the elaborate displays. Would politicians in other countries sue I wonder? Anyway, I’ll be back again next year for sure. 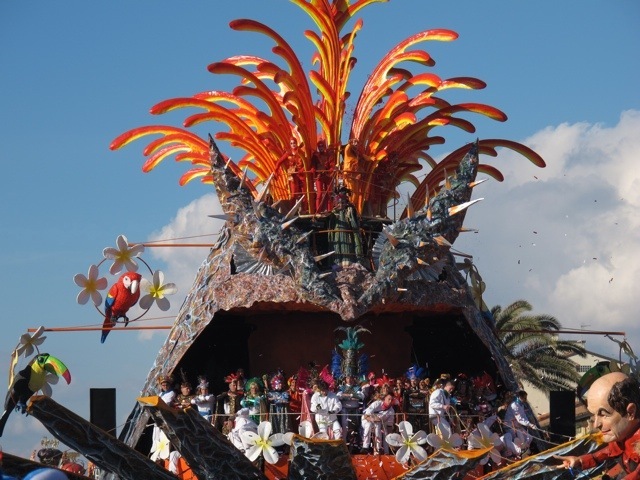 If you miss out on the floats you can always see them in the “cantiere del carnevale”, a large, new purpose-built area on the outskirts of Viareggio where the colourful and complex floats are created and assembled. Finally do not forget that, with all this funtime, Viareggio is also the place where in June 2009 32 people were burnt alive in their homes when a goods train gas cylinder convoy exploded near the station – you can still see the devastation today. So the carnevale is also a great tonic to put smiles back on people’s faces and rise above the terrible natural and man-made disasters this accident-prone country has had to grapple with, in these past few years and especially now. I am always impressed with crowds in Italy. They seem to be good natured and out to have a good time. Whole families dress up and get into the spirit. looks and sounds wonderful Debra. I would love to get there one day! It is an amazing event. I’ll be back next year. Such incredible art and work goes into these floats. It must be thrilling to see it all come alive! I would love to be able to convey the noise and the chaos that is Carnevale. It is very exciting and it is fun to be swept up in the enthusiasm. Awesome photos, and so different from Venice Carnavale (but not like I really know, since it was my first and only time this year). I’ll have to add Viareggio to my list of want to do’s! I haven’t been to the Venice Carnevale…one day. I just assumed you had since you’re so close! Funny how that is, as there are places close to me that I haven’t been to. I am about 4 hours from Venice and I have been several times. I was there once at the end of Carnevale and saw lots of people walking about in masks, but I have not been there for the main event. I love Venice and I will try to be there next year for Carnevale. You captured the atmosphere so well, I felt like I was there! Going to Carnevale in Italy has been a dream of mine….now I have 2 different ones to get to! I guess I better start planning for nespxt year, maybe???? I’m sure you will love Carnevale and there are lots of other wonderful things to see in the area. I know I’ve already said this but those floats are incredible! They are enormous and there are hundreds of people dancing and singing on most of them. Gosh I really love these photos. I know what you are saying about the ropes and safety, I was at a ‘Palio” in Camerino and I was actually able to join in the parade. Mind you I was eventually asked not to. Some of the floats had people walking in front asking spectators to keep out of the way, but most didn’t. It is all very relaxed. Very colourful! Although I would imagine this to be scary for children with those huge faces. Do kids go? Like most festivals in Italy Carnevale is a family affair. There are adults, teenagers, young children, babies, dogs…I’ve even seen a cat or two in costume being carried around. It is a really happy atmosphere and the children don’t seem to be frightened at all by the huge floats. There is always lots to see and do around here…you can’t do everything. Very nice – thank you. You really convey the spirit of the event. I wish I could show more of the madness and participation of the people. I’d love to see this live some day – who wouldn’t? It is a fun event…I will be back next year. Thank you…I have good subjects. This should be another Freshly Pressed post as well as the first part 1. The warrior is gigantic! And the sun’s touches made it even more awesome to look at the entire floats. Yup, i don’t mean to be stupid about it but “we” really need to learn not to be so conscious about everything when it comes to event celebrations. I wish you were judging Freshly Pressed. My Carnevale posts are never all that popular, but I love the event. I wish you could have been there to get into the spirit of the Carnevale. The music booms right through you and everyone seems completely taken up in the fun. Is there a parade this Sunday? Some websites have it listed as a Masked Closing parade. I am arriving in the area on Saturday, so I am wondering if I should try to make it to the parade. Go if you can. If it is listed as the closing parade I’m sure it will be great fun.